Professional pet services offering mid day check-ins and daily Dog Walking. 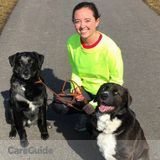 Specializing in dog jogging for high energy dogs. A tired dog is a happy and well behaved dog! Your pet will be cared for in the comfort of their own home. Contact for a free consultation with you and your pets. Animal science student looking for pet sitting/ dog walking jobs. Hi..my name is Linda. I am a young 67 year old female. I am offering love and commitment to you and your furbaby. Linda. im Lilly Dershaw and im looking to take care of animals while the owners are gone or need help looking after them.